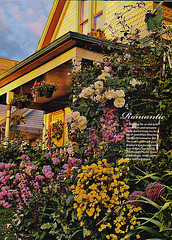 My mother-in-law had the magazine "Easy Care Gardens & Plans" by Country Almanac the June issue (#65) on her coffee table. I picked it up to flip through it and loved it. I loved this, but it looks a little complicated for me. We were looking into hiring someone to come in and design our landscaping since Tim doesn't have the time and the thought of it scares me to death. 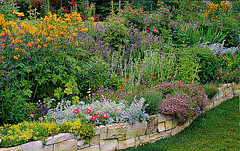 But this little magazine has such good tips like "the tallest plants should be no more than two-thirds the width of the border" and for "all roses, all the time, the place to start is with Flower Carpet Roses used as a ground cover." Lots of specific advise for the logical scientist in me and lots of great pictures for the visual learner in me. I think I'm going to give it a shot myself. 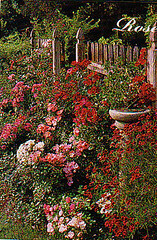 I'm going to put a little rose garden next to the kitchen porch. My mother-in-law is also great at this sort of thing and she's offered to come out and help me once the field work is done. We are going to use some of the limestone taken out of the foundation to separate the driveway from the landscaping on the south side of the house. unfortunately, the carpenter still hasn't shown up to work on the trim work for our porches and I don't really want to start any projects around the house until he has finished. I like your idea of putting up a rose garden near the kitchen torch. I love roses, they are my favorite flowers especially the red ones. Hope to see a picture of it when you are finished.